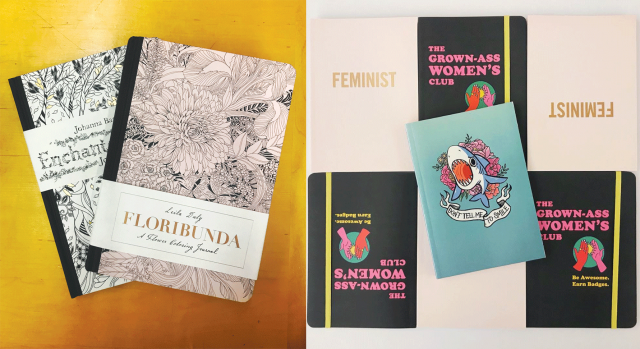 There’s something magical about a crisp clean blank book with a badass cover… Bookmans, the purveyor of fine readables and cool knickknacks, is no slouch brand new journal department. They include themed foiled notebooks, classy leather bounds, bright sketchbooks, gorgeous Decomposition books, and more. There’s a design for everyone, from sleek guitars to ballerinas to fantasy art. One of my favorite things to do while working at Bookmans is eyeing those beautiful embossed covers and foiled colors – they make the books almost glow! If you’ve been bitten by the journaling bug or are looking for the perfect gift for someone special, you just can’t beat a journal. Let me tell you why. Though the covers are what draw us in they are, of course, only half the charm. Inside, journals are blank, either ruled or not ruled (for your pleasure, I assume). Within these pages, the world is your oyster – one with lemon and rosemary for those keen on recipes. Perhaps the Oyster is a helpful friend on the way to the Merfolk capitol with two pearls to offer in exchange for news of the forbidden surface, or whatever story you’ve been kicking around your head. Maybe that elusive song lyric just hit and “like the oyster guards its pearl, you girl, guard your heart.” Maybe it’s a place where you just tell your story and learn to examine and express your feelings… about oysters. Whatever your needs may be, a journal is waiting to be your closest confidant. Science junkies know that journaling is a useful therapeutic tool. The act of simply writing by hand is beneficial. Psychology Today has several articles (like this one) dedicated to how handwriting improves learning and reading. Studies show the act of writing engages the brain in ways typing doesn’t. Additionally, students who know how to write long-form read and absorb information. Notes taken by hand are easier to recall than those typed on a laptop. Aside from the educational side of writing, it also gives you a link to the future and the past. Writing in a journal can, in many ways, be a time capsule. There are several journals still used today as important historical accounts such as Samuel Pepys diary from 1659-1669, which recounts life in 17th Century England, offers insight into world-shifting events. Want a first-hand account of the plague of 1665 and the Great Fire of London? What about what it was like to be a young teen hiding from Nazis? Look to a journal like Pepys’ and Anne Frank’s for the details textbooks cannot express. A journal of today may be a special piece of history years from now. Whether you need to keep track of your Dungeons and Dragons character stats, enjoy jotting down crazy dreams, are a budding novelist, a Twitter post planner, or need a gift that will make even the most discerning giftee happy, a new journal is perfect. Peruse the selections today at your local Bookmans. You never know what treasures those blank pages will unearth!